U.S. Naval Cmdr. Timothy Clark, commanding officer of the USS West Virginia, will visit Marshall University’s Huntington campus Thursday through Saturday, Oct. 12-14, as part of the university’s Homecoming festivities. Clark will tour the campus, meet with the university’s Department of Military Affairs, sit in on a class at the Arthur Weisberg Family Applied Engineering Complex, meet with President Jerome Gilbert and the College of Business Advisory Board, and attend a Deans’ Appreciation Dinner. He also will visit with the football team, stop by the gravesite of the 1970 team players, and participate in game day Homecoming activities. The visit was initiated by Young Thundering Herd football coach Jack Lengyel, who also served as athletic director for the U.S. Naval Academy. Lengyel met Clark about a year ago, when Lengyel and his wife toured the USS West Virginia and had lunch on board. Lengyel got in touch with Lance West, Marshall’s vice president for development, and West started the process of planning Clark’s first visit to Marshall University and the state of West Virginia. 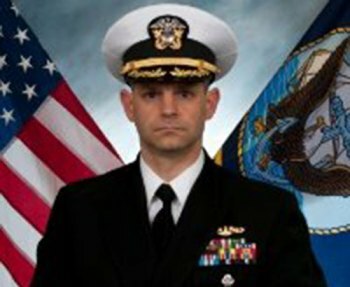 Clark has been commanding officer of the USS West Virginia since November 2015. He is a South Carolina native who began his Naval career as a Nuclear Machinist Mate, first serving on the USS Montpelier in Norfolk, Virginia. He helped with the ship’s construction, commissioning and post-delivery testing. In 1998, Clark graduated from the U.S. Naval Academy with a Bachelor of Science degree in political science and then, in 2004, earned a master’s degree in leadership and human resource development from the Naval Postgraduate School. He has had sea tours as a division officer aboard the USS Rhode Island in King’s Bay, Georgia, as an engineer officer aboard the USS Montpelier in Norfolk, and as executive officer of the USS Boise, also in Norfolk. He has participated in five strategic deterrent patrols and deployment in the Mediterranean Sea, Arabian Gulf and North Atlantic. His shore assignments include serving as the 18th company officer at the U.S. Naval Academy in Annapolis, as flag aide to the commander of Submarine Forces in Norfolk, and as action officer assigned to the of the assistant secretary of the Navy for Research and Development and Acquisition.